That sounds good to me! The median rent for a one bedroom apartment in San Francisco is a stunning $3,670 a month, and a bedroom in a shared apartment will set you back at least $1,500 for a decent location on the peninsula. And if you have to battle it out with all of the other recent college graduates from Craigslist for that room, you’re probably going to need to bribe somebody, too. I’ve heard it’s pretty standard to bring a gift like wine or envelopes full of cash when you show up to check out a room. Sometimes the resident roommates invite all of the prospective roommates for a demented party to see who they like. It’s like fraternity rush for desperate assholes. But this box-in-the-living room idea, now that’s something I can get behind. You’re lucky to have any space at all to yourself in San Francisco’s housing shortage, but it’s damn near impossible to find such a cozy little sleep pod like this. 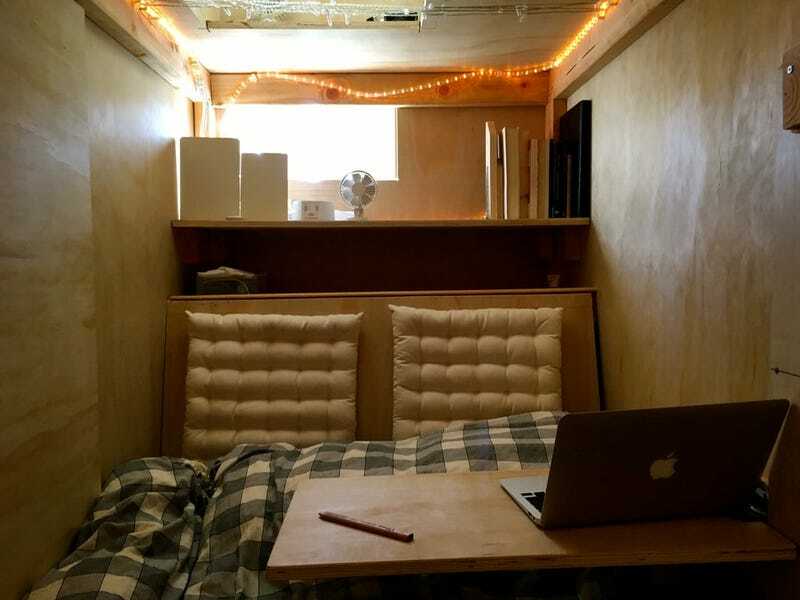 Peter built the thing with his bare hands for only $1,300 and even included a little window and some fairy lights so that it feels less like coffin and more like a magical escape from the dystopia that is the city by the bay. It’s eight feet by 3.5 feet (a little longer and wider than a coffin). The real perk though is that it’s 4.5 feet tall (much taller than a coffin). And look, there’s a cute little shelf for his MacBook.